I walk into the wet lab after a night of rocking and rolling and find the day shift team prepping for and executing their respective projects. I sit down with Jason Phillips, a fisheries biologist with Oregon State University at the Hatfield Marine Science Center, to talk about his focus aboard the RV Ocean Starr. Jason serves as lead scientist on the box core sampling project. The box corer is a piece of equipment used to literally “grab” a sample of the seafloor for analysis both of sediment grain size as well as benthic (seafloor) life. It is reminiscent of an old candy grab penny arcade where a crane’s claw is used to scoop candies from a floor of goodies. I don’t anticipate the pay load of this scoop to be as deliciously appealing. Jason explains that he joined this cruise off the coast of Oregon to learn more about the seafloor along a specific series of coordinated sampling stations. These sites are aligned perpendicular from shore and increase in depth as we move further along the continental shelf away from the coastline. The ultimate goal of his project is to better understand the communities of organisms that may be impacted by the commercial development of renewable wind energy. Yes, I’m talking about giant wind turbines anchored to the seafloor, not unlike the terrestrial wind farms seen throughout the country. Before any ground is broken on such a project, the potential impacts have to be investigated. Enter Jason and the rest of his team at Oregon State University. 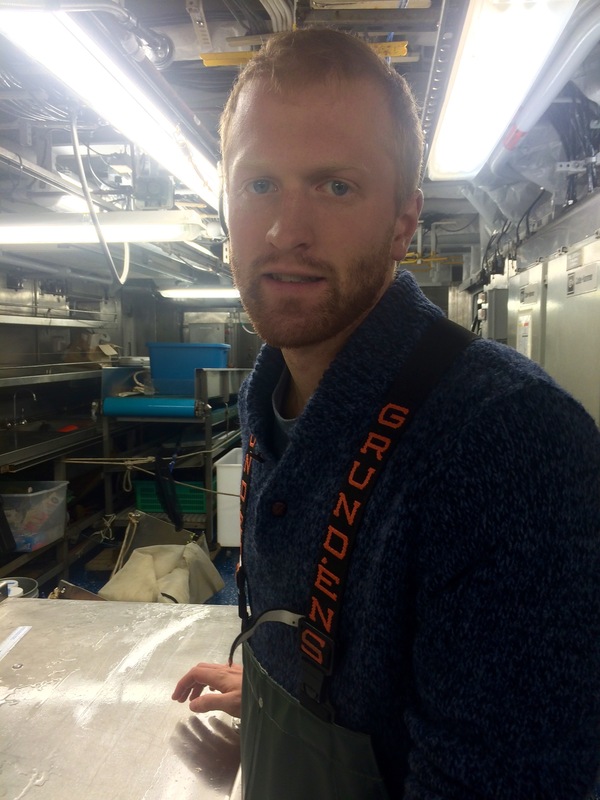 By establishing a fundamental understanding of baseline benthic communities as well as characterizing bottom types, Jason hopes to better explain how the ocean floor changes as we move across the continental shelf. Jason asks if I’d assist in the deployment of the next box corer and I jump at the opportunity to get my hands dirty. We step onto the stern deck where most of the scientific equipment is kept. There, in all of its silvery splendor, sits the box corer, securely resting in a heavy-duty metal cradle. Weighing in at 450 lbs. 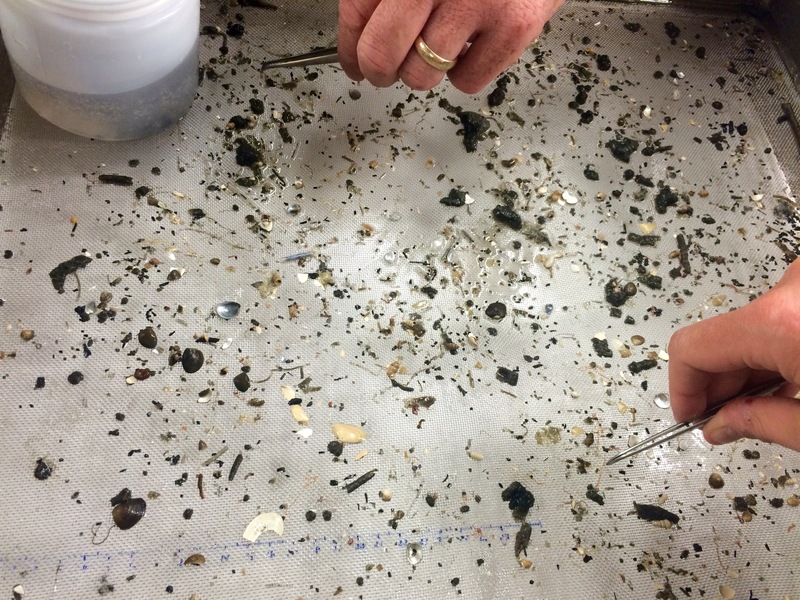 when empty – it’s even heavier when filled with a core sample of seafloor sediment. The ocean is a bit rough today so Jason assigns me a supporting role. Using a thick rope attached to a handle on the box corer my job is to keep it from swinging uncontrollably as it is raised from its resting cradle and lowered into the water. I’m warned to keep all extremities out of the way as it wouldn’t take much for this piece of scientific kit to become a glorified wrecking ball capable of devastating blows to both ship and its operators. The winch begins to tighten the slack on the cable line and the box core rises from its cradle. Though it swings slightly from side to side, it cleanly enters the water and starts its decent into the dark depths. This time it will collect a sediment sample at 200 meters, and takes nearly six minutes to reach the bottom. When it does, its gravity-release mechanism triggers and the shovel-like claws propped open on the surface close as the wire is wound back in, scooping a load of seafloor and any organisms living in or on that substrate. About 10 minutes later, the box corer returns to the surface draining gallons of water as we maneuver the even heavier steel trap back to its cradle. Once secure, Jason collects a raw sample in a small jar, labels it and sets it aside for grain size analysis in the lab. Using a ruler, he measures the depth of the total sample. I learn that sample size depends largely on grain size. The further away from shore, the deeper the water, and a lower impact by waves and surface currents. The result is the settling and compacting of fine particulates. Conversely, seafloors closer to shore “feel” the more of the effects of these ocean forces, which allows for less settlement, and lighter particles are washed further offshore. There we would find sandier substrates. This sample is incredibly “muddy”, made up mostly of clay. 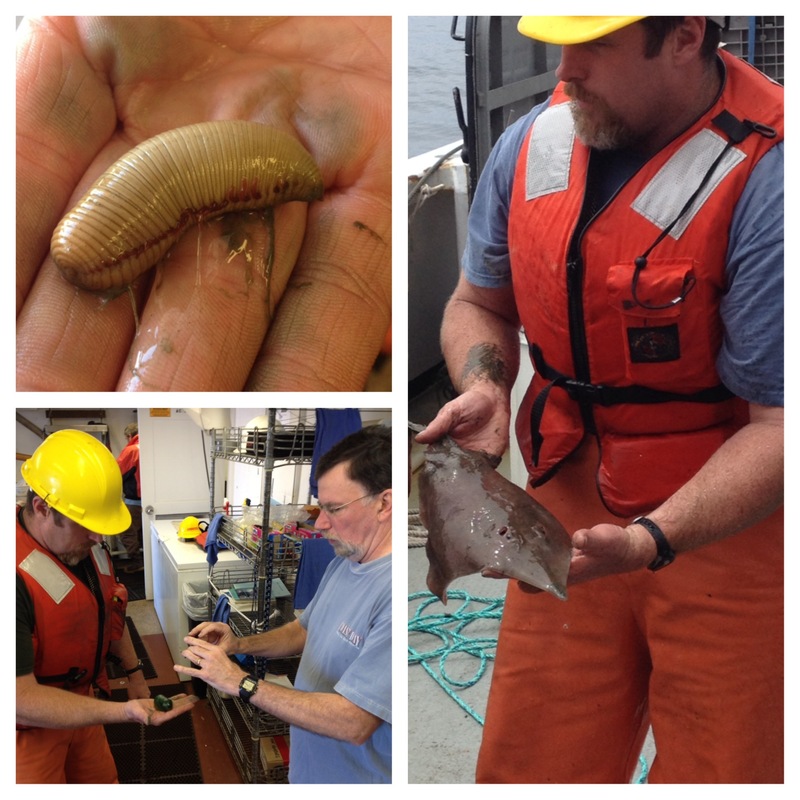 Top left: Peanut worm (emits terrible stench), Bottom left: Dr. Ric Brodeur and Jason Phillips assess an inky worm. Right: Jason Phillips quickly returns an unexpected skate. Once the seafloor “muck” is extracted from the box corer, Jason uses a small wire mesh and a garden hose to sluice the sediment, breaking up the larger chunks as he hunts for signs of life within. Any critters found are carefully extracted using tweezers then added to neatly labeled jars for further analysis back in lab at Hatfield. Invertebrates dominate the small haul of benthic life: feather worms, polychaetes and echinoderms are numerous. Occasionally the box core delivers unexpected tag-a-longs. On two separate occasions a large fish and a skate that, of all the places on the bottom of the ocean, happened to be in the wrong place at the wrong time and took the ride a lifetime. It was an exciting hands-on experience and I quickly learned that the tighter the leash the more stable the box. I am thankful to report that no limbs were lost in the sampling of the seafloor. Later, I sit down with Katherine Dale, a student intern aboard the RV Ocean Starr. Kat currently attends the University of Miami and will be entering her senior year after which she will have successfully earned B.S. degrees in Biology and Marine Science with a Minor in computer science to top it all off. 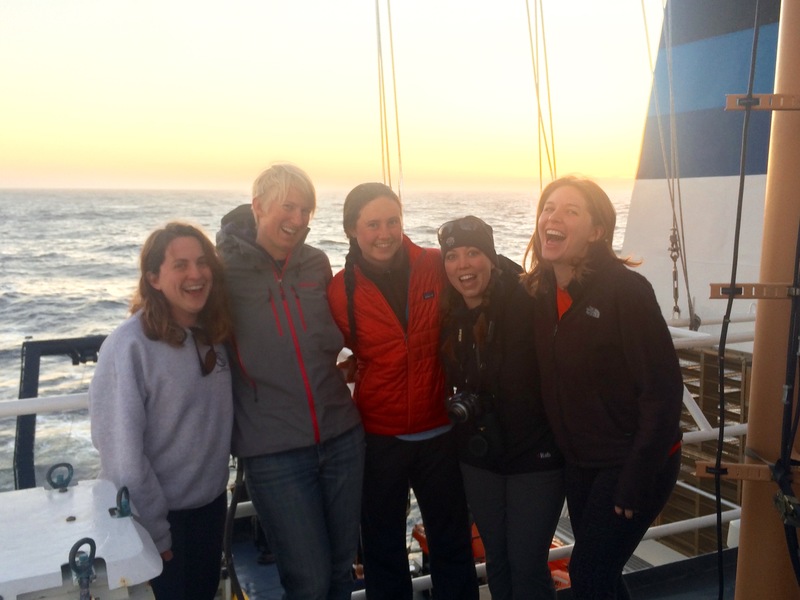 She arrived on the Ocean Starr as a result of being named recipient of the Ernest F. Hollings scholarship by NOAA. Applying in her sophomore year, Kat received a generous $16,000 towards her junior and senior years of study. The intangible value of the scholarship is in NOAA’s expectation of awardees to participate in a paid internship with a NOAA affiliated mentor and/or facility with the intention being to introduce undergraduate students to NOAA as a potential career path. Kat has chosen to spend her summer at the Hatfield Marine Science Center under the mentorship of Ric Brodeur, the chief scientist on this cruise. She is here with similar intentions as I have; gain field experience on a NOAA research cruise. Unlike me, this is not her first time at sea. 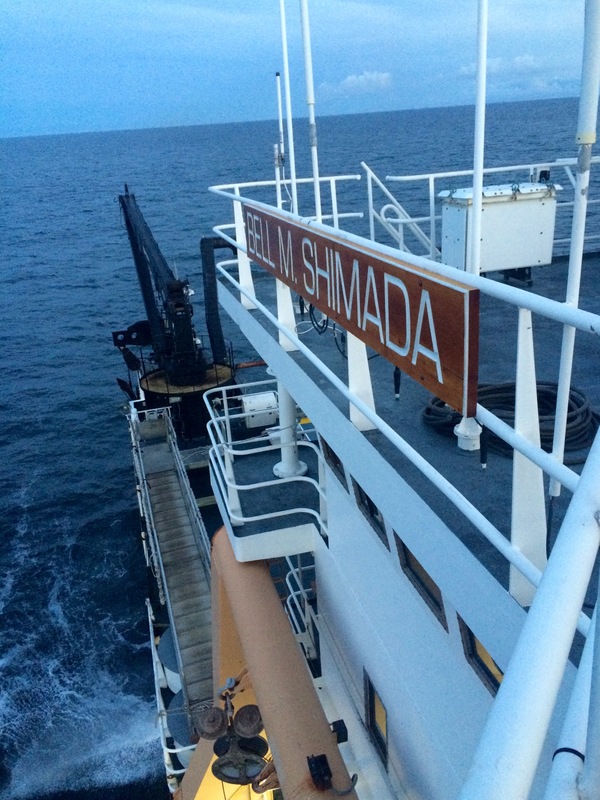 A year ago she toured the Bahamas on a month-long research trip with the Southeast Fisheries Science Center, a regional NOAA research lab based in Miami, Florida. I ask Kat what she would advise a younger group of marine enthusiasts just starting out. She suggests that budding students should not be afraid to pursue diverse experiences and keep an open mind. There will be great jobs and some not-so-great jobs, but it is all experience, and more experiences lead to more opportunities further down the road. Kat isn’t quite sure what she wants to do with her laundry list of degrees but finds herself attracted to both the world of scientific research as well as that of science education. Perhaps a role in education outreach for a science organization is somewhere in her future. 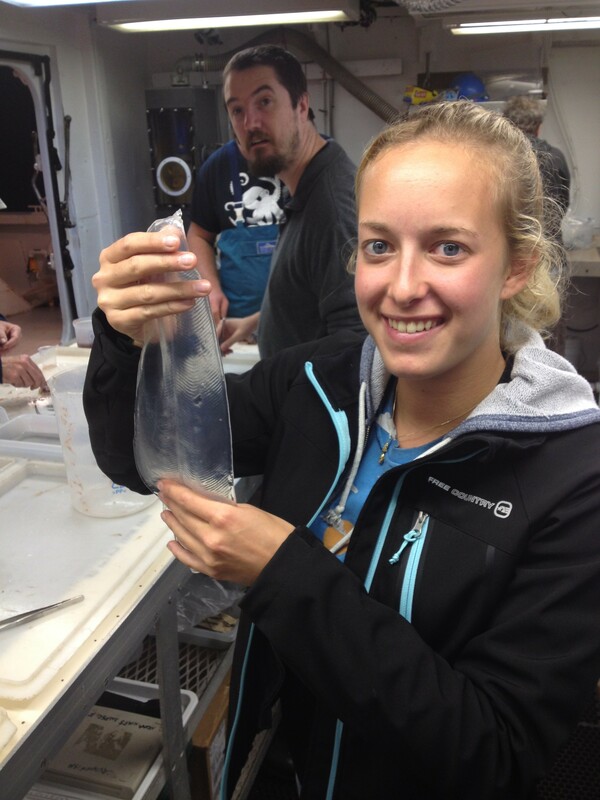 Hollings Scholar Katherine Dale holding a eel larvae during trawl sorting. Adjusting to life on a ship like the Ocean Starr has been interesting. Not necessarily difficult but not easy either. It’s just, different. In my previous post I mentioned the struggles of using the restroom and just getting in and out of bed at night. I’ve since taken my first shower aboard this floating facility and to say it was challenging would be an understatement. When the ship rolls, I roll and when it rocks, I follow suit. I’m still working on those sea legs. 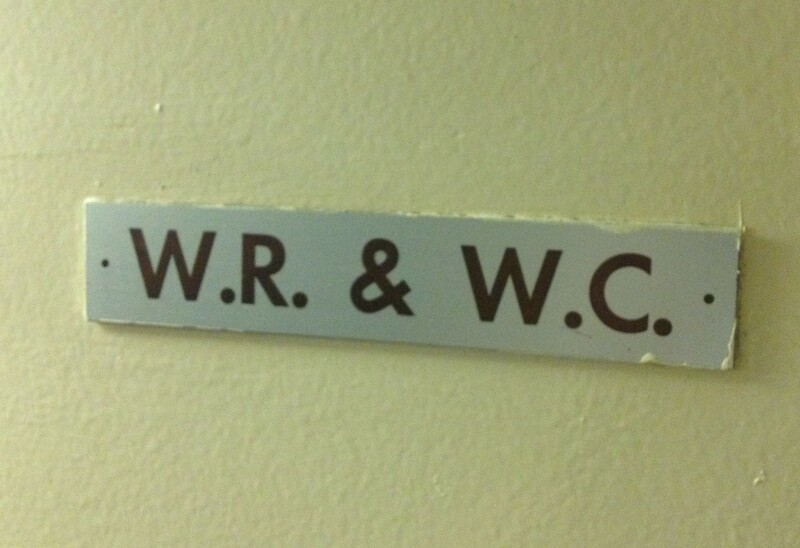 It all gets amplified when it comes to anything bathroom related especially when the venue is communal. Trying to keep a change of clothes dry in the shower is hardest! I’ve made a few trips back to my stateroom in wet clothes. Last night we ran into some rougher waters and falling asleep was nearly impossible. Each time I even began to doze off, the ship would roll so violently that I would be forced into the wall or the railing on the bunk. Being a side-sleeper it’s difficult. I realized the side-to-side motion is generally a result of three major sources: our northbound travels, the bow-to-stern orientation of my bunk and the west-east flow of the swells toward shore. Eventually I gave up attempting to find sleep in my own berth and decided to roam about the ship in search of a more stable locale. 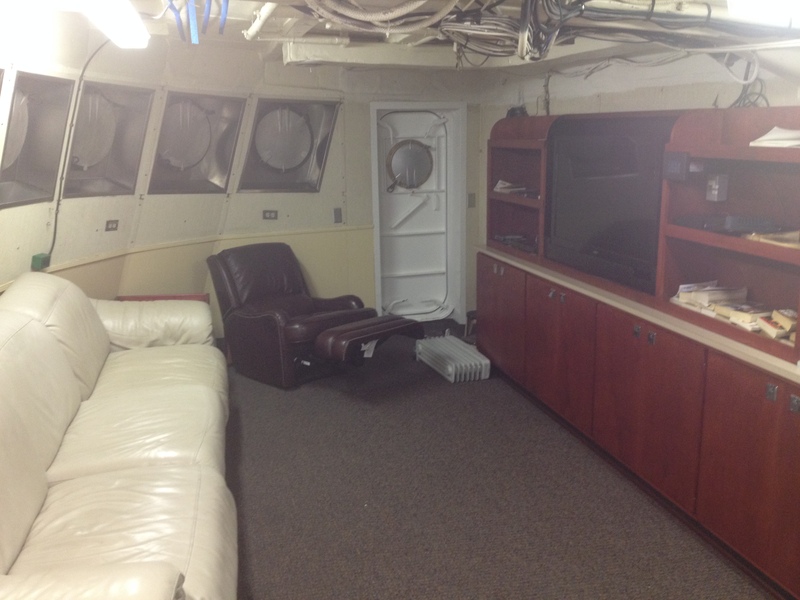 In the crew lounge, I found an enormous couch which just so happened to have an orientation to match the swells. Although with each roll I could feel a slight bit of added pressure at my head or toes, I was not long rolling side-to-side. Proud of myself, I fell asleep immediately. Let me clarify the my tone as I describe the trials above. In no way do I consider any of these experiences to be “bad”. I signed up for life at sea and it wouldn’t be realistic if I didn’t struggle to adapt somewhat to such a foreign lifestyle. I am embracing every moment as a unique investigation into the life of not only a scientific research team in the field, but also the life of the crew that keeps us running. Besides, the immediate perks far outweigh the struggle of adaptation. The food is delicious. I realize that in that statement I echo just about every other Teacher at Sea in TAS history. All the same, the food is delicious. I suppose it’s one of the small comforts that both crew and science team look forward to on a regular basis and Crystal, the head chef, and her partner Liz take great pride in the meals they prepare. Already I’ve gorged myself on freshly- made pizza, gyros, fruit-filled pastries, stir-fry dishes, quiches, steak and potatoes and swordfish just to name a few! The galley is the ship cafeteria and is always stocked with an assortment of goodies: pop, juice, coffee, fruit, and an array of granola bar-type pocket snacks for when you need a quick pick-me-up on the job. There’s even a salad bar with a variety of toppings to choose from. That’s not even the best part! Aside from usual dinning occasion: breakfast, lunch and dinner, there is a midnight rations service simply called “mid-rats” onboard. It is a meal with naval ties designed to satisfy the hunger of those getting off or just starting their shifts in the middle of the night. Many onboard swear mid-rats to be the best meal of the 24 hour period. I can’t decide, it’s all so tasty! All this and I haven’t even mentioned the overstocked freezer dedicated to nothing but ice cream! I thought, being at sea, I’d drop a few pounds but with four meals a day all the snacks I could ever want, I don’t see that happening. I’ll be lucky to break even. 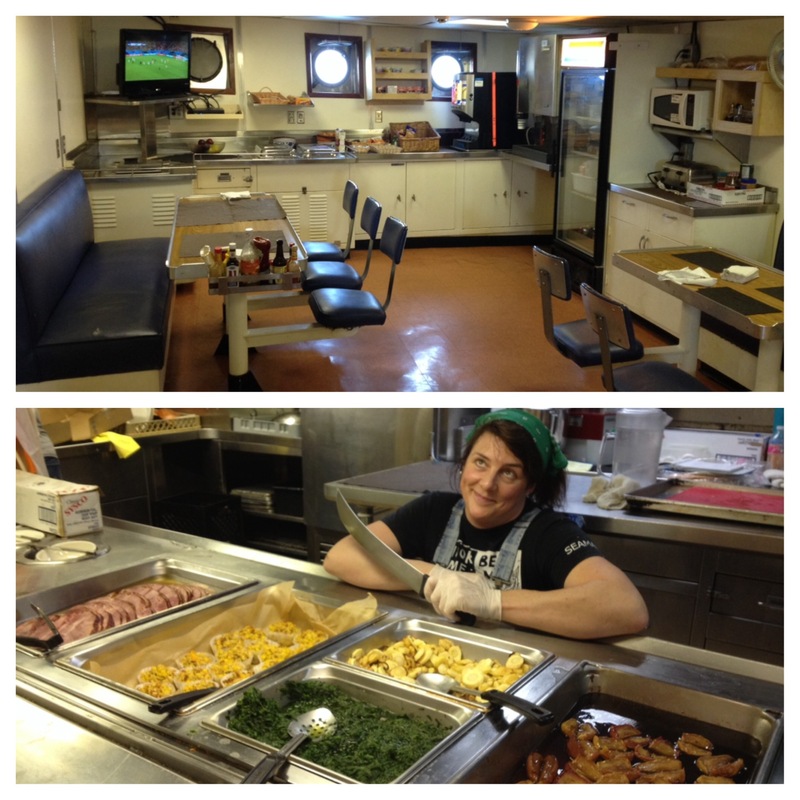 Top: Galley complete with World-Cup Soccer in the background. Bottom: Mid-Rats Menu–Stuffin’ Muffins, Spinach, Parsnippers, Baked Apples in Caramel. My current shift runs from roughly 2:00 pm – 2:30 am. This time frame allows me the opportunity to participate in a variety of sampling activities that happen only during daylight hours, as well as to help sort a few trawls into the wee hours of morning. Generally speaking, I fall asleep by around 3:00 and wake up for breakfast at 6:00. I love breakfast. I head back to bed for another four hours give or take, depending on how rough the ocean is beneath me. Around 10:00 I’ll wake up and grab some coffee and check in on various projects, lending a helping hand if needed. I’ll generally take my coffee to the flying bridge checking in with Amanda in regards to any recent sightings. On that note, we stumbled across a hunting group of Stellar sea lions yesterday. They followed us for a bit, as did a flock of gulls, I imagine because they mistook us for an active fishing vessel and were just looking for a free meal. Day time activities: CTD, box core, neuston net tow, bongo tow, jelly fishing, etc. generally wrap up between 2:00 and 4:00 and at that point we begin transit toward the next trawling station. The commute time can be anywhere from 4 to 6 hours depending on conditions and the team finds various ways to pass the time. Some take naps or watch a movie in the lounge while others play cards, grab a snack, or join Amanda on the flying bridge to look for marine animals. I generally use this time to chat with those around about their projects and think about how to synthesize these encounters into blog posts. I’ve also found myself collecting so much great footage that I spend some time slicing and dicing a short film here and there featuring the day’s happenings. Once we arrive at the first trawling station the night team sets up shop. We trawl and sort samples throughout the night with the last trawl wrapping up at about 5:00 in the morning. So far, I’ve only made it through the first two or three trawls before turning in for the night. The evening is always an adventure. Just last night while we sorted krill from rockfish, a bird flew into the wet lab and landed in a large bucket full of catch; this guy was a storm petrel, which are apparently attracted to and disoriented by lights, making this a relatively common event. We were able to get it out the door and back onto the ocean both swiftly and safely. I wrap this post up as I sit atop the flying bridge on an overcast day off of the Oregon Coast. I can faintly see the famous sand dunes framing the coastline. No more than ten minutes prior to typing these very words did we watch four humpback whales breaching clear out of the water less than 300 meters from the bow of the Ocean Starr; an absolute thrill to see!